Beads and components I have made. 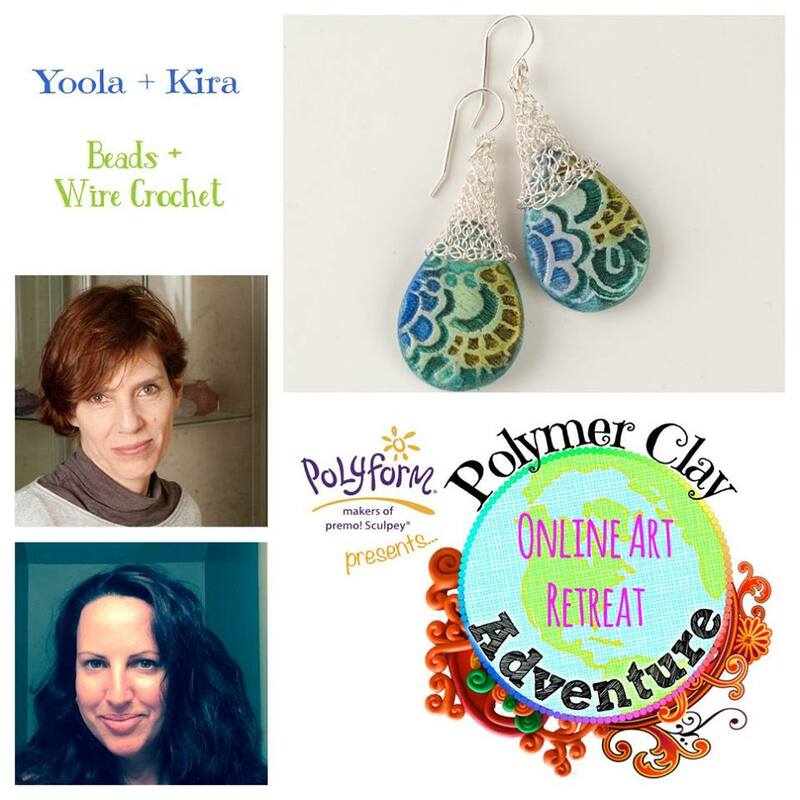 This year I signed up for the Polymer Clay Adventure. I’m generally not very good at following a tutorial literally, but I thought this year it would be a good exercise to try a run through at least once. 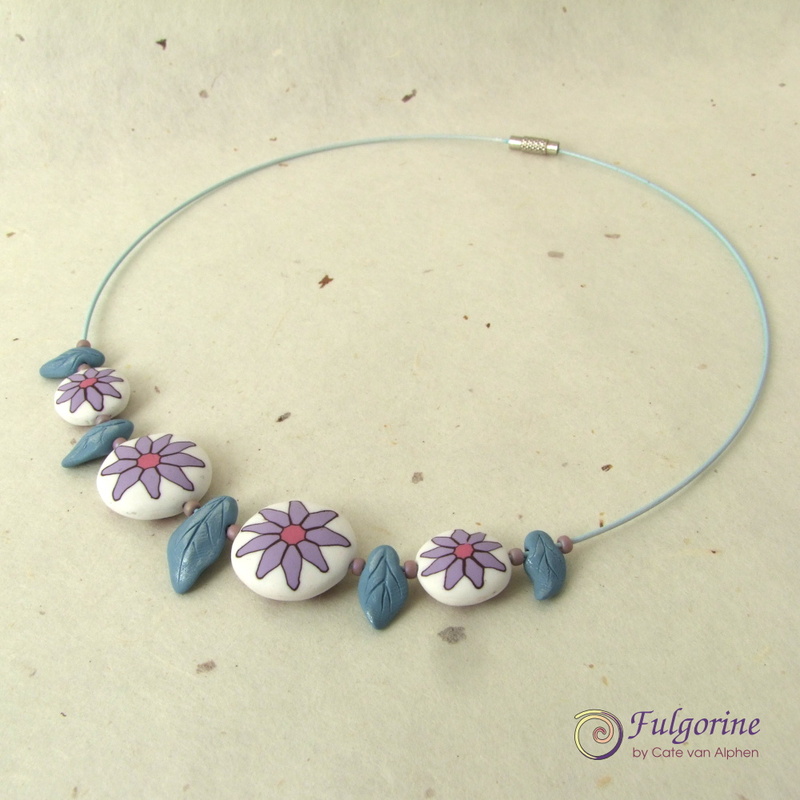 The first tutorial I had a go at was a combination of polymer clay beads (by Kira Slye) and wire crochet (by Yoola). I almost managed to make something similar. 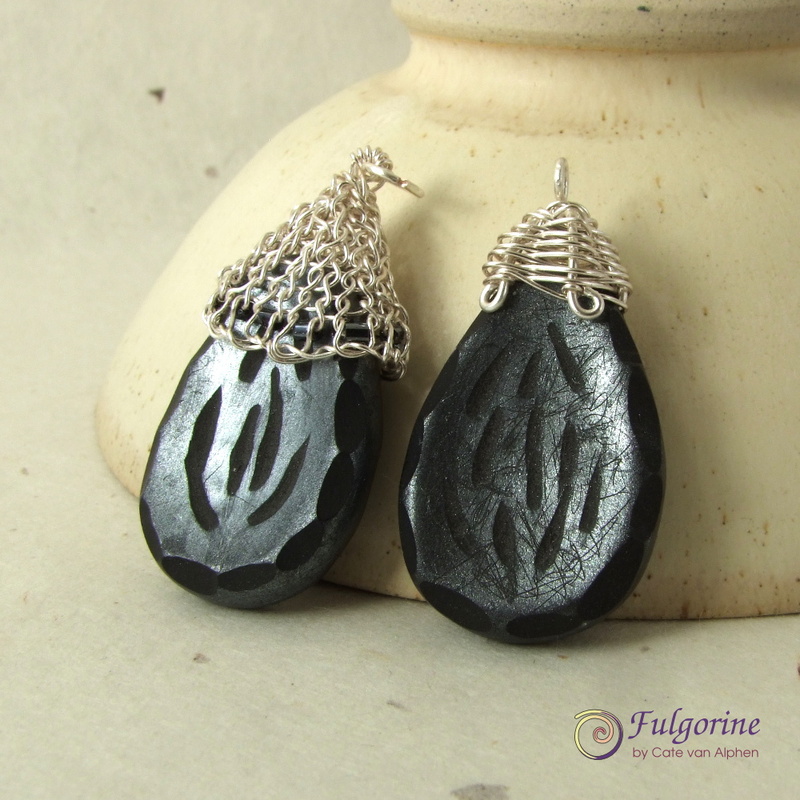 I used carved beads (from another of the retreat tutorials) for these earrings. I didn’t have gold hooks so I made some spirals that I attached to steel studs. I thought the focal beads were a bit too chunky so I added another bead to give the earrings more length. I also made a pendant with a stamp textured bead. When I made this bead I thought the edges were a bit fat so I pinched them and added a slight wave. Some of the purple coating had cracked off the wire by the time I worked the bottom row, but I thought it picked up the gold mica on the bead quite nicely so I still used it. I made another pair of carved beads, this time in silver, since I thought the first ones were a bit fat. I included some black beads in the wire crochet but they are a bit too similar to the bead colour and don’t really stand out. I also made a pair of purple beads similar to Kira’s, but I haven’t yet decided what to do with them. If you’d like any (or all) of the pendants and you are willing to pay for the postage*, pop a comment here on my blog before the end of January. If more than one person wants a pendant I’ll do a random selection. *Shipping is from England (95p to UK, £3.15 to US addresses). 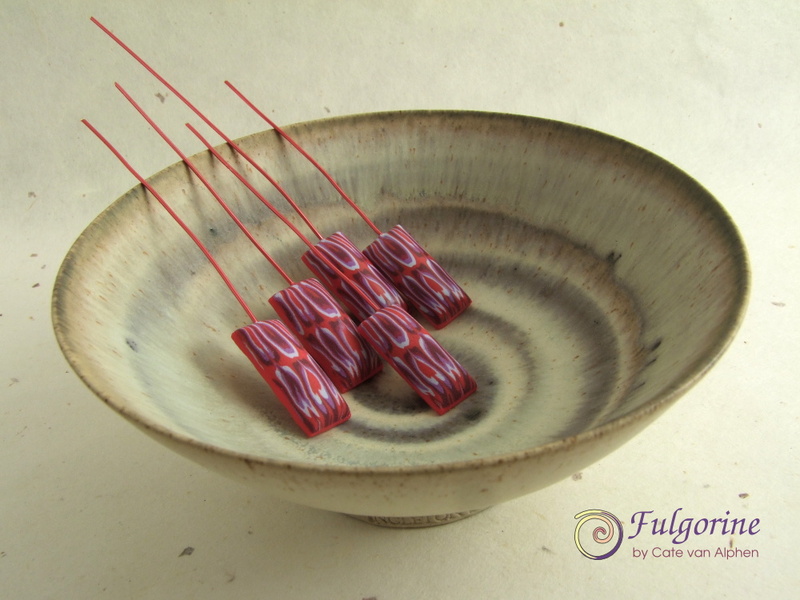 This week I have made some beads using the canes inspired by the vintage teacup I’ve been working with. So far I’ve made one necklace. 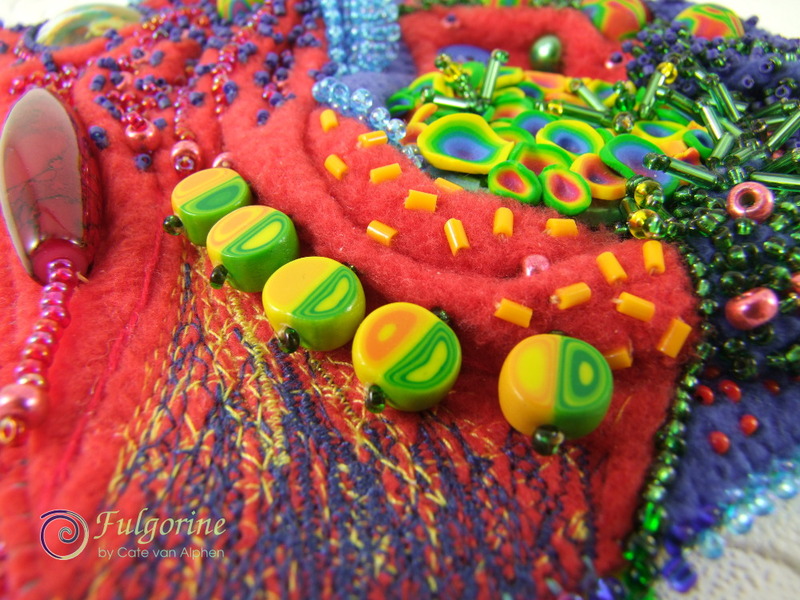 The beads have different patterns on either side so the look changes depending on how the beads are flipped. I plan to make some more beads using the canes, and I have made some accent beads to go with them when I do. Remember it’s nearly time for the Art Charm reveal :). 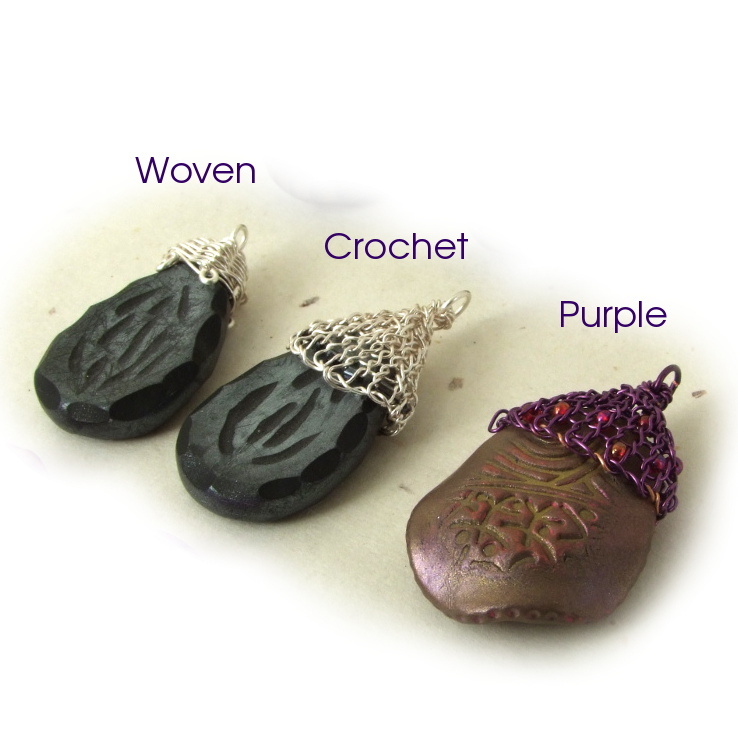 I’ll be showing the fairy tale inspired charms I made along with links to see what the other participants have made. 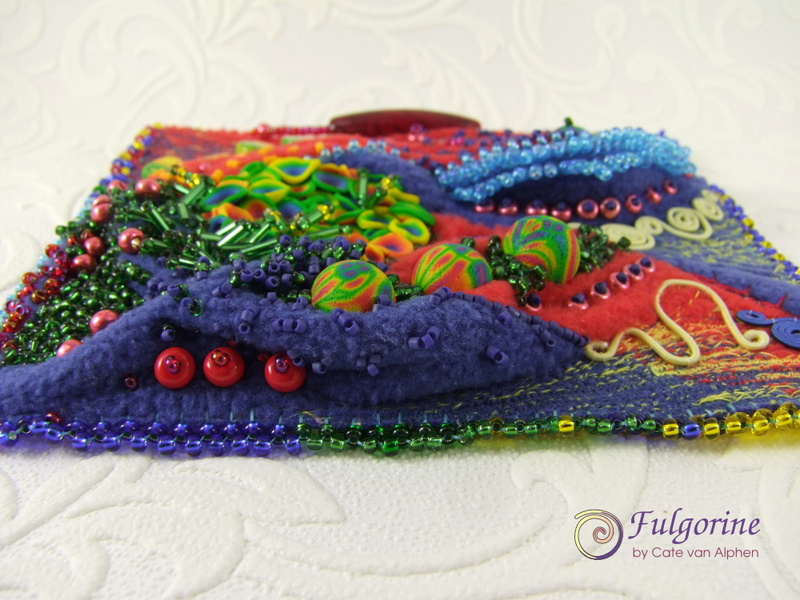 This will also be the start of the auction to benefit Beads of Courage, so be sure to come back on 30th September. 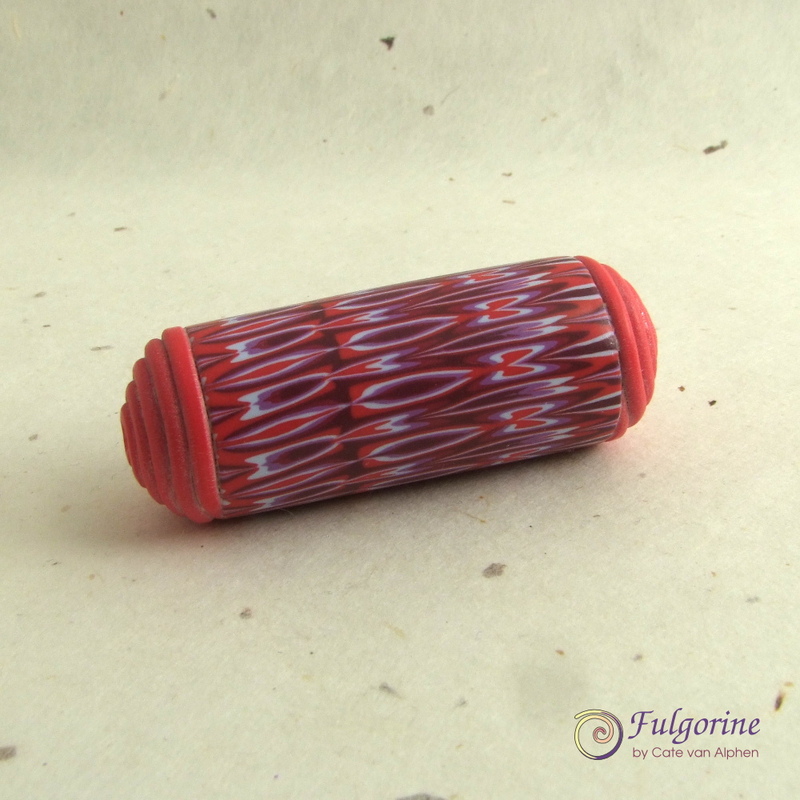 This week for my Polymer Clay Challenge, I have unmade a vessel. 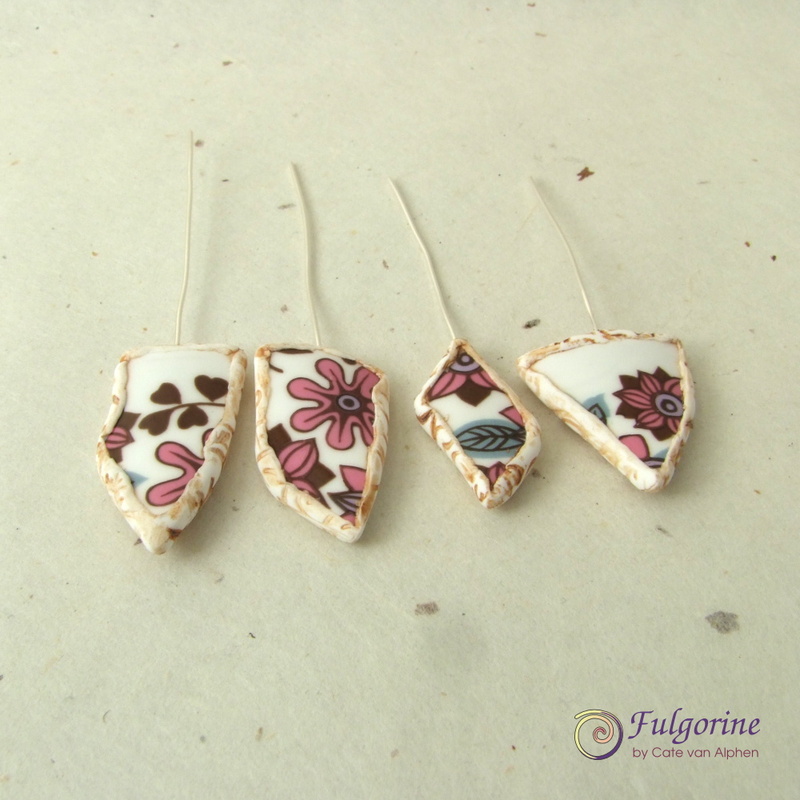 I wrote previously about how I am fascinated with pottery shards, and this week I finally got around to combining them with polymer clay. I have made a few headpins. These were from a vintage teacup that died of natural causes. I textured the backs with a stamp and antiqued them with acrylic paint. I think they are quite successful. 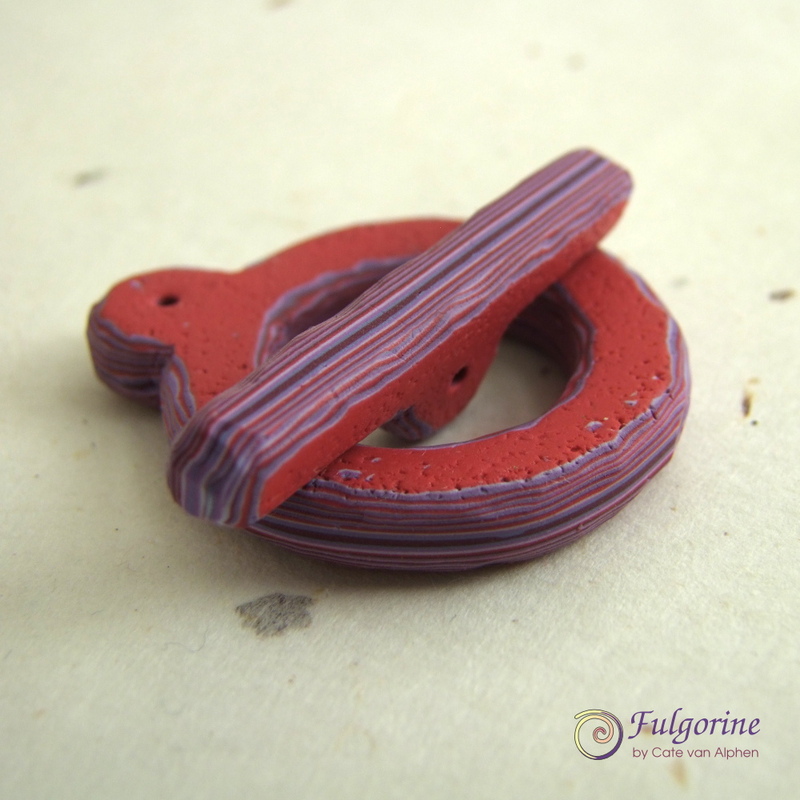 The polymer clay seals the razor-sharp edges nicely. 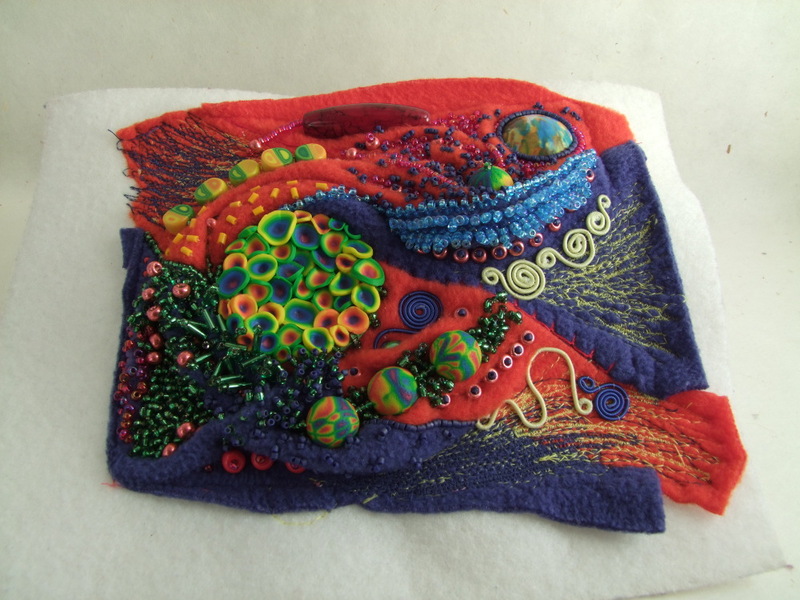 So I am still running late for showing my weekly 2016 Polymer Clay Challenge projects. My vessel for this week, 23, looks a bit of a mess, but it is a work in progress. 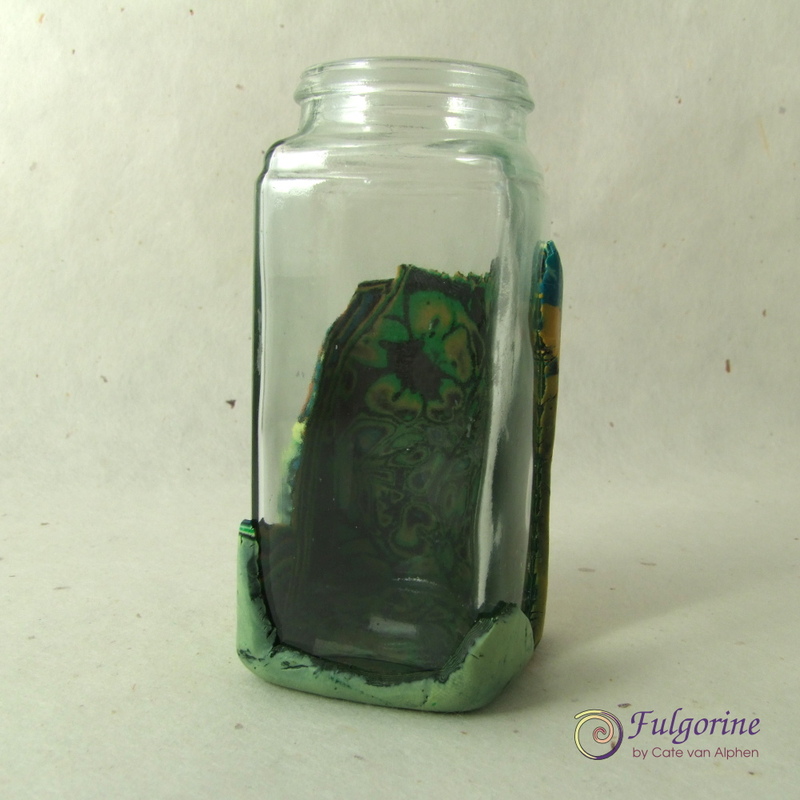 I have partly covered a glass jar with a sheet of polymer clay mokume gane facing inwards. I plan to build something up around the outside leaving some of the glass open to show the interior pattern. For the last couple of weeks I have been trying to clear away some of the scrap on my work board, so I also made a few beads while the bottle was baking in the oven. My vessel for this week currently has plaster drying on it as I left it a bit late before starting. I am still finding this challenge to be hugely out of my comfort zone. 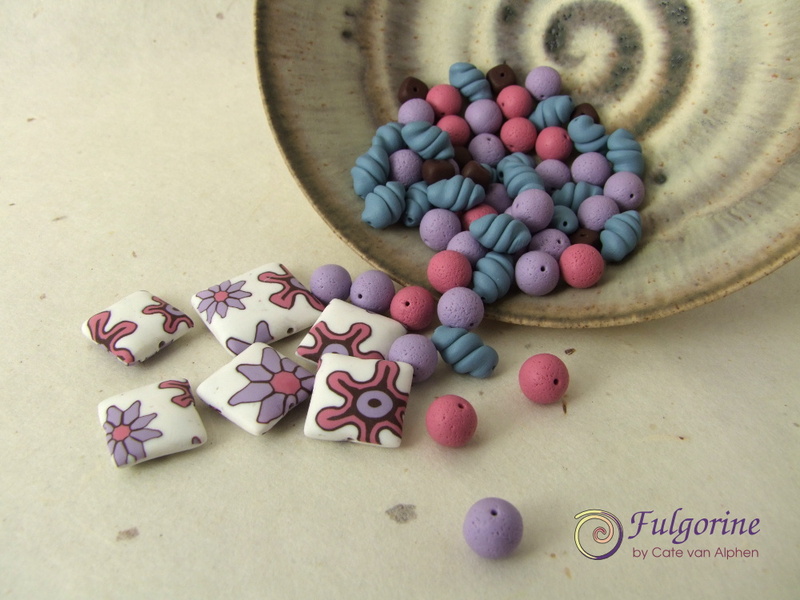 This week I did manage to make some beads as I find those relaxing, so that’s what I have for my 2016 Polymer Clay Challenge. 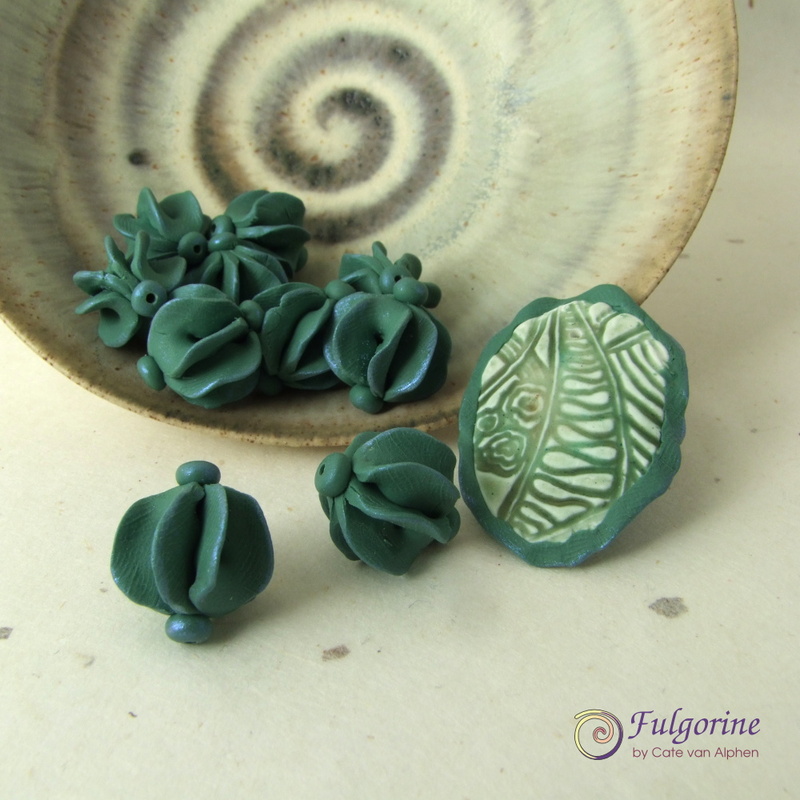 I really enjoyed the shape of the beads I made for my Art Bead Scene earrings, so I made a few more in a succulent blue-green colour. I added a subtle glaucous edging with some blue interference mica powder. The pendant started off as a way to use up some of the extra glaze from last week’s bowl, and when I got it out of the oven to put the beads in, I thought the greens went well together. 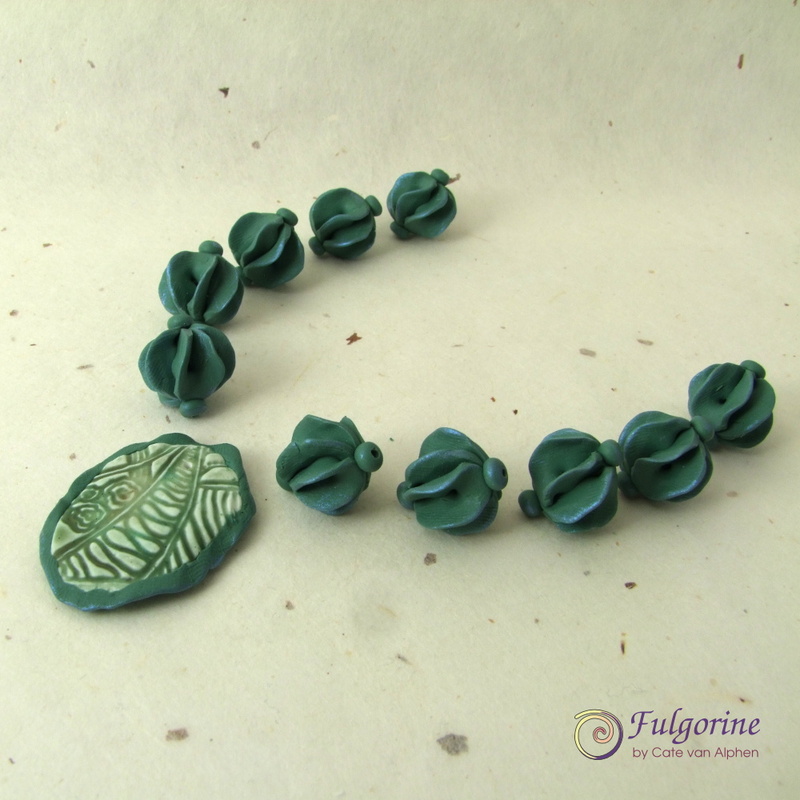 So I added an organic, slightly ruffled edging in the same clay as the beads. I’m planning to make a few more beads, and then I should have enough to make a necklace. I’m starting the New Year with a look back at the old year. 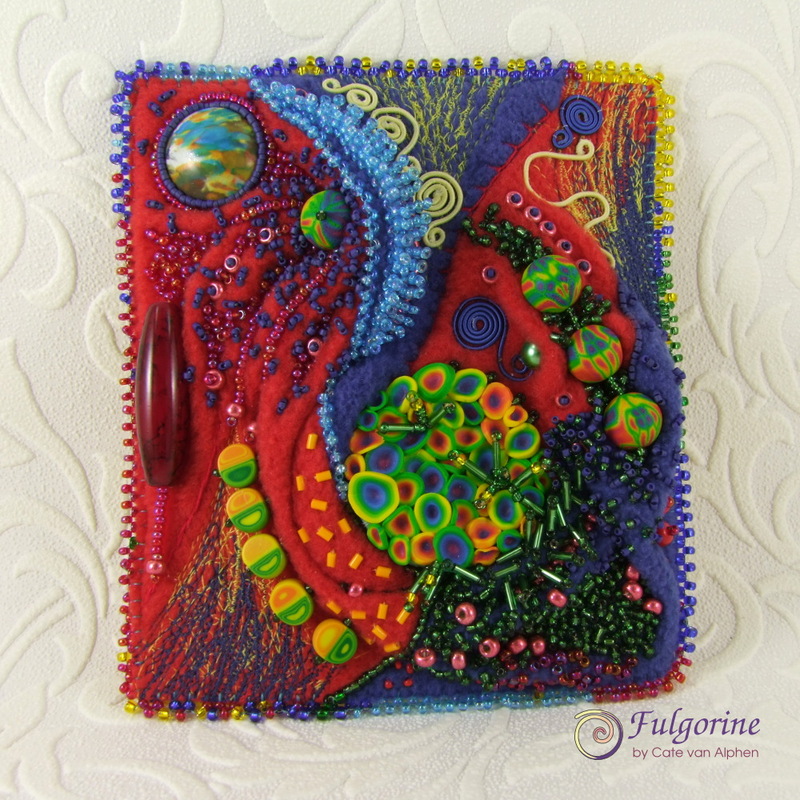 I took part in Katie Oskin’s 2015 Polymer Clay Challenge which I combined with my idea of dividing the year into blocks focussing on each colour of the spectrum. Each week I made bead components*. Look at the pretty gradient that they make! For 2016 I plan to make a vessel each week. I’ll probably start with covering my collection of glass jars, but I’m also hoping to make items of jewellery like inros. 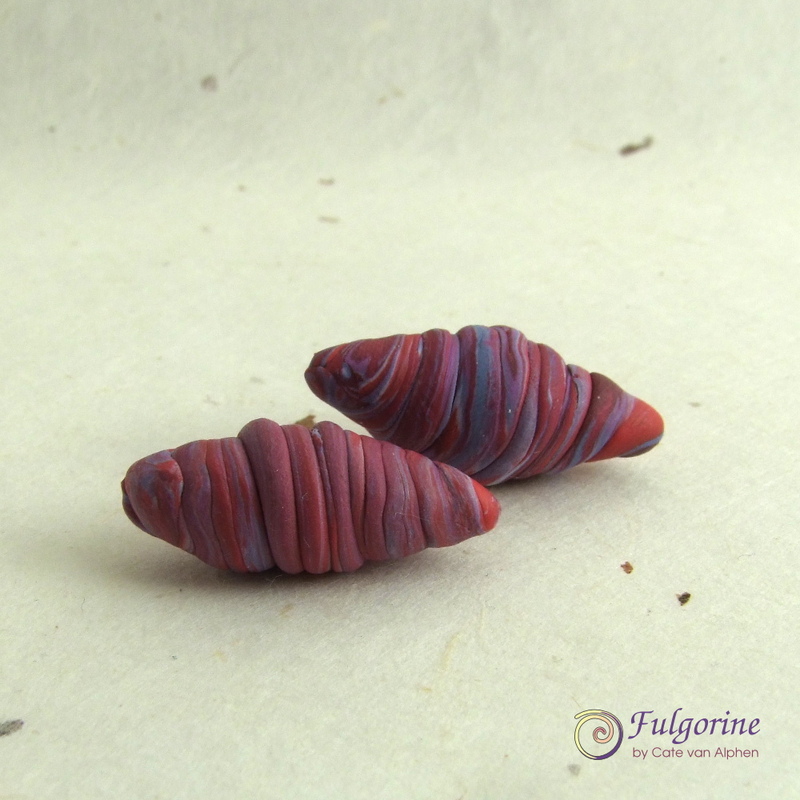 I’ve made a group on Flickr if you’d like to join in (it’s not limited to polymer clay since although that’s what I work with, I love to be inspired by other media too). I hope my year, and yours, will be filled with beautiful things! * I have a page dedicated to the Spectrum Year project where you can click on the thumbnails and find my colour recipes. 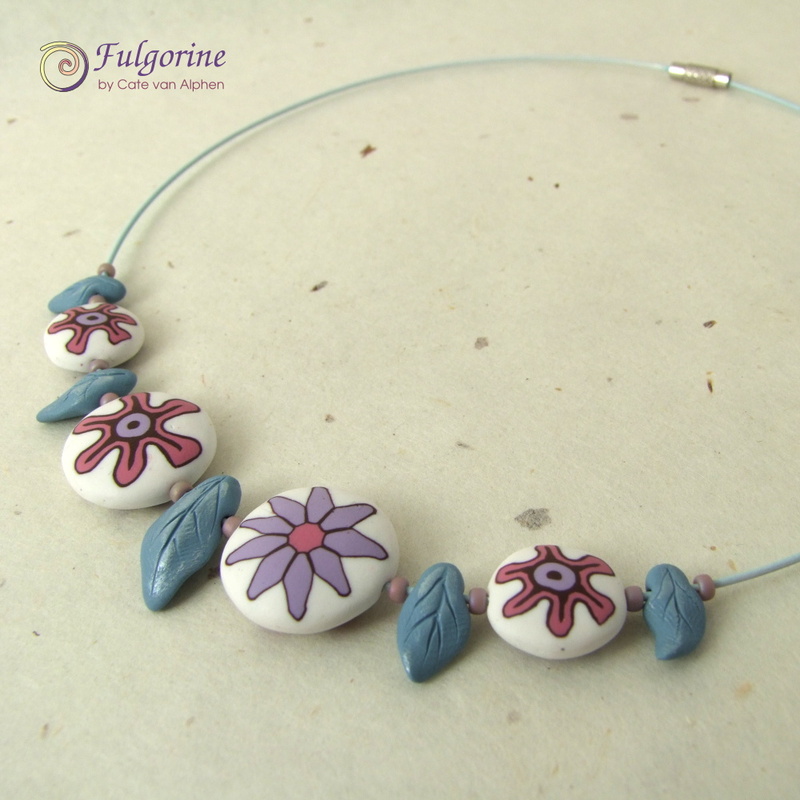 I am working on adding some of these beads, and jewellery made using the colour palettes, to my Folksy shop. 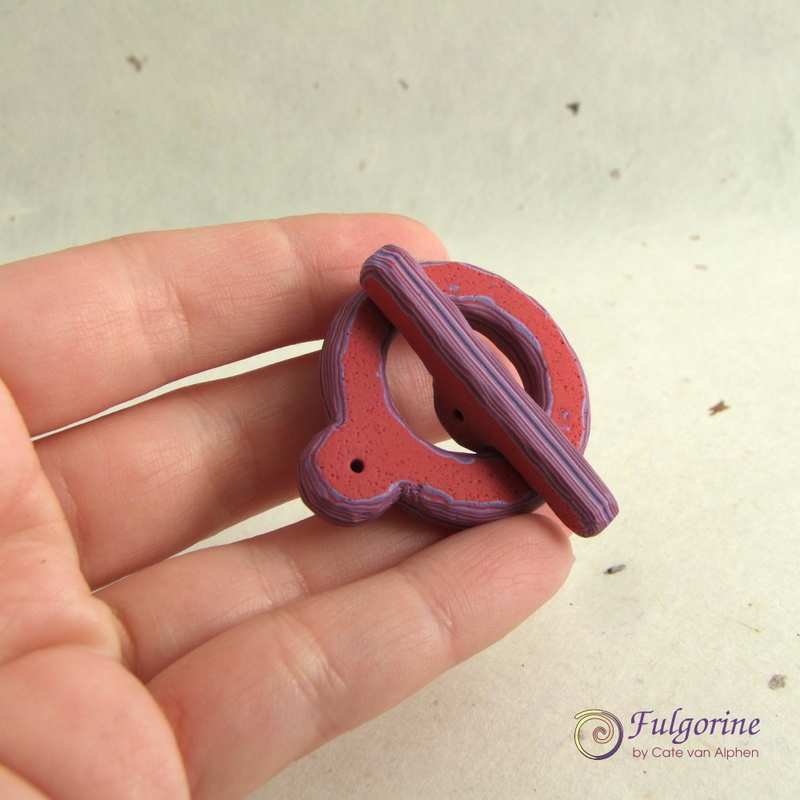 For the last week of my 2015 Polymer Clay Challenge, I have made an old school bar and loop toggle clasp. It’s pretty chunky and mostly red. I wanted a contrast between the pattern on the side and the front as the bar will be seen side on when in use. I’m mostly happy but I think it could do with another iteration – the stripes in the bar are a bit thinner than I’d imagined. This is officially the last week of my Spectrum Year, but I’m sure I will be making more as I feel I’ve barely scratched the surface. For 2016 I plan to make a vessel every week. Have a look at the Flickr group I’ve made if you’d like to join in. 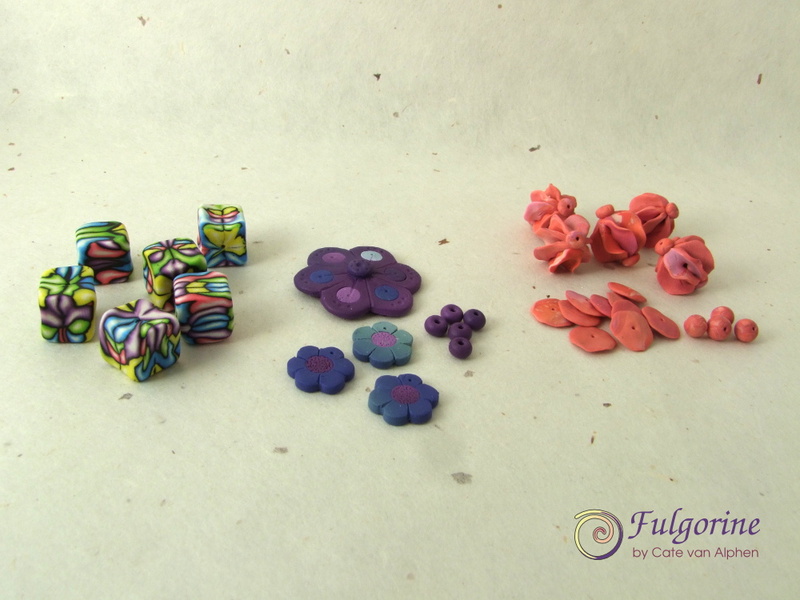 I got a bit distracted with Christmas preparations, so my blog for the 2015 Polymer Clay Challenge is a little bit late this week. I made some headpins with the leftover damascus ladder cane from last week. 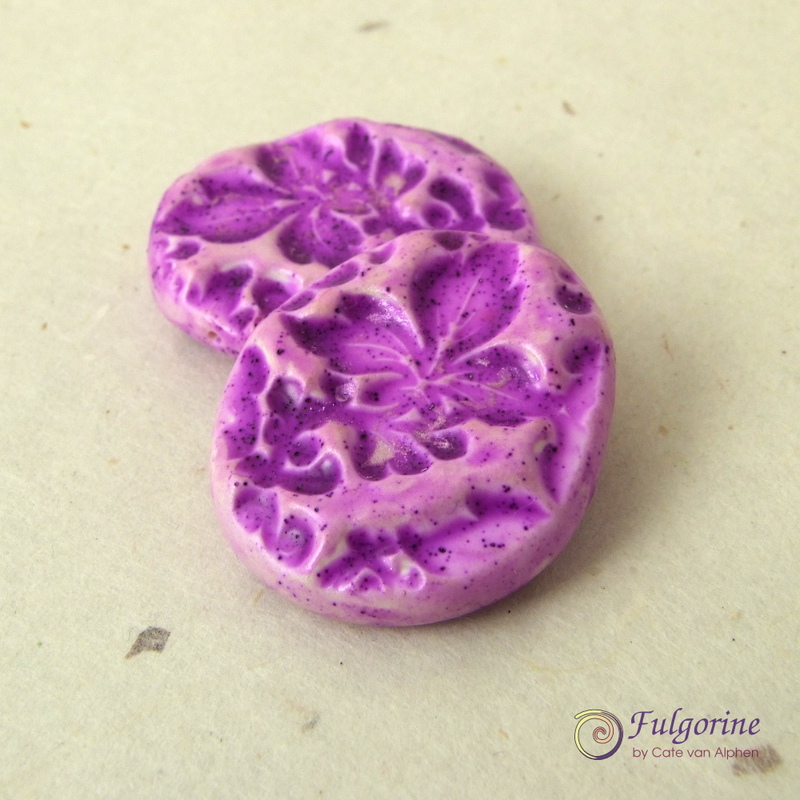 I also managed to finish the focal bead from last week. The ends are now neater, but I think I prefer the darker scrap colour. This week my energies have mostly been diverted into making Christmas gifts (which I can’t show yet) and a cow costume (which isn’t polymer clay). 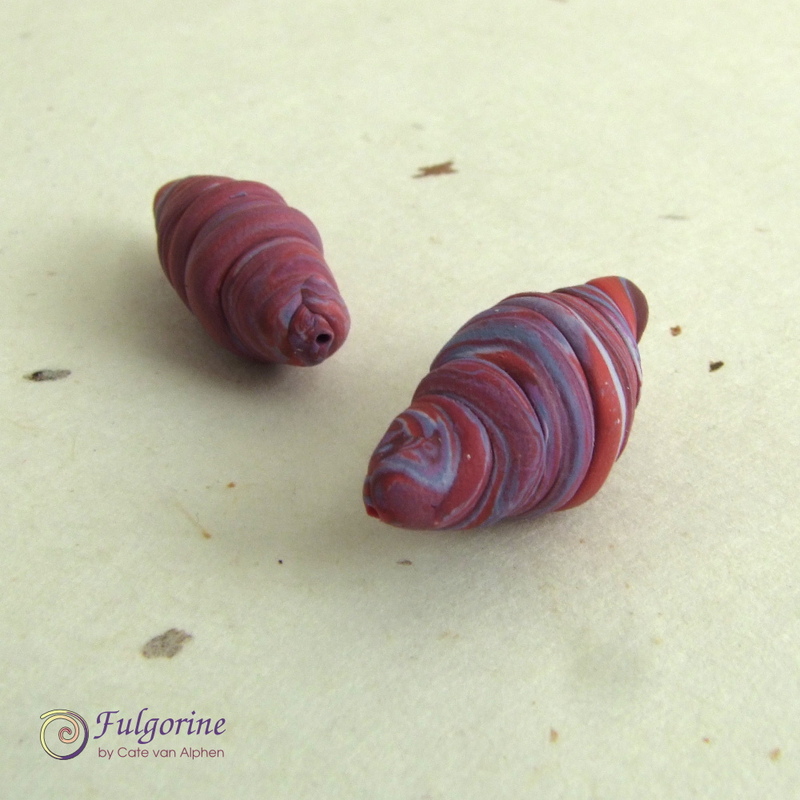 So the red beads I have made for my 2015 Polymer Clay Challenge are pretty underwhelming. 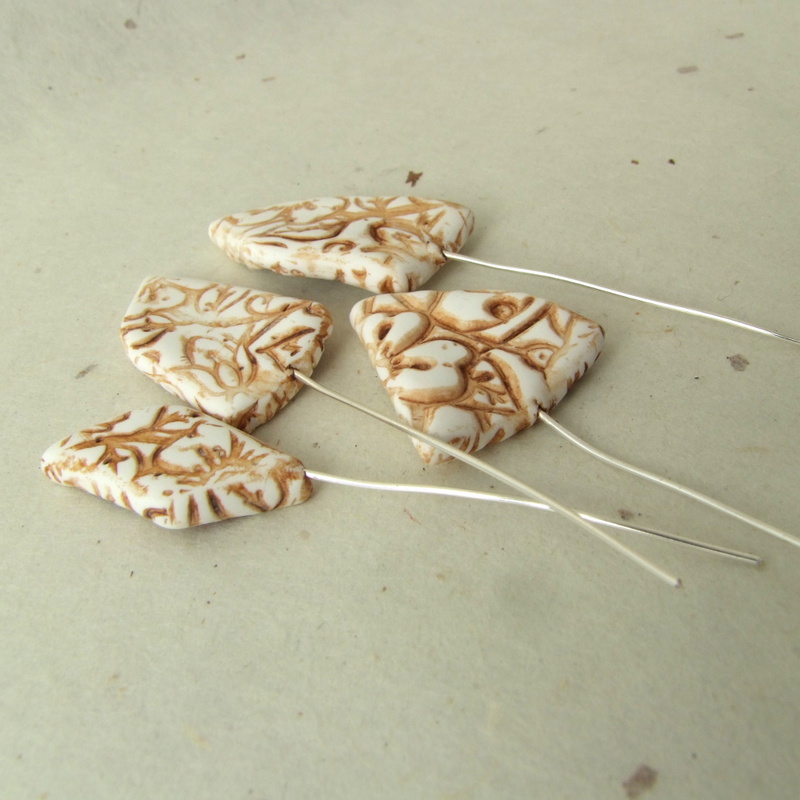 They are literally scraps of mokume gane twisted together to make a bead. The two beads don’t match particularly well, but they might make a quirky pair of earrings or a fun accent in a necklace/bracelet. I quite like the organic look of them. They remind me of crysalises. Maybe something exciting will emerge?